Report on Navy Medical Exercise "Citadel Rumble" September 5Th/6th San Diego California. "Winlink was used both on packet and HF, and worked very well in message delivery"
WA area and the Navy Medicine West Headquarters at Naval Base San Diego, CA. An element of the event was testing with Radio Relay International and the Express Radiogram. Radiogram welfare traffic a regular part of future exercises. were the on site managers. Amateur Radio Safety Foundation, Inc.
Winlink is an all-volunteer project of the Amateur Radio Safety Foundation, Inc. (ARSFI), a non-profit public benefit corporation. If you use Winlink email, or correspond regularly with someone who does, please donate to ARSFI. By giving $25 each year you will do your part to keep this important system running. Donations are tax-deductible by US federal taxpayers. A donation is always the best way to say "thank you" to Winlink volunteers! Want to purchase a registration key for your software? That's different than a donation! When you shop Amazon, always use smile.amazon.com and choose ARSFI as your charity. Amazon donates 0.5% of your purchases to the Amateur Radio Safety Foundation, Inc. Same Amazon, same prices! Painless! Help spread the word: Tell your Facebook friends. Share this on Twitter. The Winlink radio email system and software are built, maintained and supported entirely by volunteers. Click this link for sysop and user support. The entire Winlink system is dedicated to the volunteer Gateway Station Sysops who support and run the thousand-plus stations around the world. Without them, Winlink would not exist. Be sure to write with generous thanks to the sysops who provide your service ([email protected]). Volunteers attend daily to the Winlink web site, e-mail groups, tutorial groups, nets, user registrations, access rights, RMS servers, catalog and bulletin updates, and much more. The Winlink Team also receives generous technical input and contributions from authors and developers. We thank the following outstanding contributors for their dependable, invaluable, prominent services and superior work products. Bravo! 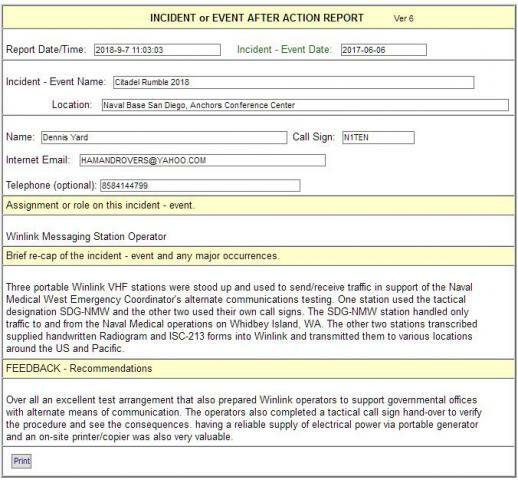 Who expertly administer and maintain the DHS NCC SHARES Winlink Hybrid Radio Email Network. Gateway Sysops on-air in 2000, and on-air today! Please say "thank you" with a donation to the Amateur Radio Safety Foundation, a non-profit public-benefit corporation.